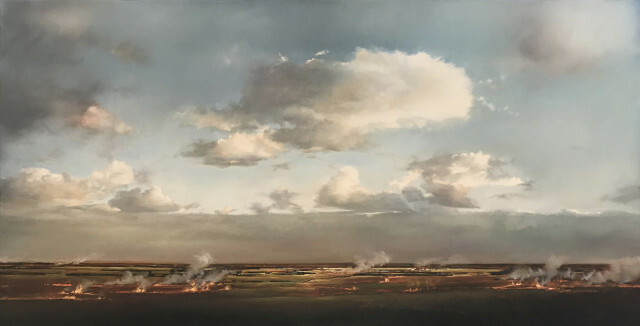 Simon Edwards’s recent works on aluminium are marvelous atmospheric paintings of the imagination. They are of no specific place. But through layers of oil paint and ink vigorously rubbed, brushed and glazed, he conjures dark mountain spaces and lakes under looming skies that feel familiar to us all. In preparatory works he collages views of cloud ridgelines, snow ice and river- often from photos taken whilst walking in the interior. He also sketches en plein air, or on site, relentlessly gathering and honing and reworking his observations in the field before committing to the majesty and artifice of a new painting. “The work places itself somewhere between a modernistic reliance of the essential qualities (of the materials and the methods of painting) and an awareness of the traditional forms of the landscape…the work becomes a result of what is happening on the surface at the time and building on chance effects that present themselves, contributing to a sense of space distance and movement’. Born in Christchurch, New Zealand in 1975, Edwards gained a Bachelor of Fine Arts at the University of Canterbury in 1997. He spent his childhood in the countryside of the South Island, where the Canterbury Plains, with its vast and open skies, meets the foothills of the Southern Alps. Edwards continues to work and live in Christchurch, New Zealand and is represented in many national collections including the Christchurch Art Gallery, Te Puna o Waiwhetu. In 2005 he won the “People’s Choice Award” in the Anthony Harper Art Prize and in 2006 the first prize in Landscape in the Parklane Art Awards.